It has been awhile since I did a Menu Plan Monday post so I thought it was about time for one. Some weeks I really like to plan our menu and other weeks I would rather run a marathon! This week I'm doing several new recipes so I'm hoping we like them. Do you try new recipes or are you one that just likes rotating the same recipes over and over? We have started a weekend tradition to go eat at a local diner. B loves eating a big cooked breakfast and I'm not a huge fan of breakfast food. So going out for breakfast allows us each to eat what we like. This is what I have been ordering lately, it is super yummy! 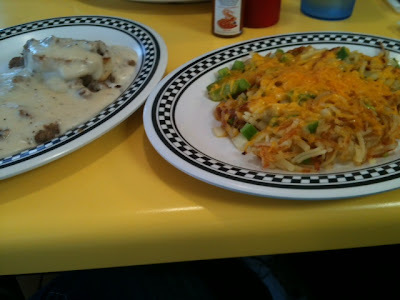 Jazzed up hash-browns with cheese, onions, and green peppers with 1 biscuit and sausage gravy. It is NOT healthy but it is delicious. Sunday: Grilled hot dogs for B. Grilled sweet potatoes and veggies for me in my Pampered Chef grill basket. I love grilled veggies, do you? On Sunday morning B asked if we could have hot dogs for dinner. I had to laugh since in my Weekend Wanderings post I talked about my horrible moldy corn dog experience! Monday: BLT Grilled Cheese and Sherried Tomato Soup. For gluten free use gluten free bread or skip the bread. Tuesday: Fend for ourselves. I have my photography class. For lunches this week I'm trying something new, salads in jars! I originally found this idea from Fitness, Health, and Happiness. Here are the two salads I'm trying this week. Have you tried salads in jars? Do you think they keep longer? I am looking forward to the convenience of them! What are you eating for dinner this week? Hey Andrea! Jill and I also started a menu planning link up on Sundays... we'd love to have you join us!